Interface designed many creative energy and water solutions for this greatly anticipated renovation. As a result, overall energy use is expected to be 40% less than a baseline building. Completed in two phases, the new center fuses together the school’s existing Physical Education Building, Student Recreation Building, and future Health and Human Performance Center. The project is a state-of-the-art model for sustainable design and substantially improves the existing dated facilities. 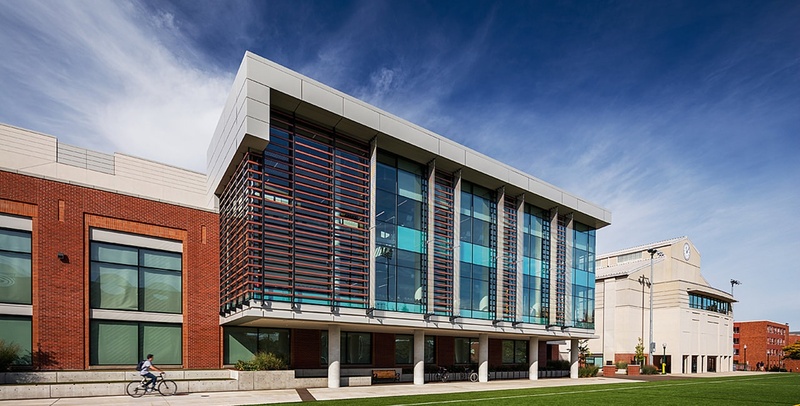 With the additional challenges of LEED Platinum certification, a limited budget, and a tight site, Interface came up with several solutions including design for a rooftop solar hot water array, air-to-water heat pumps, a low-energy dehumidification system, air-to-air flat plate heat recovery, and chilled beams. The design team also tapped into existing resources by utilizing waste heat from the steam tunnels that run below the site. Air-to-water heat pumps use the waste heat and draw temperatures up to 100 degrees to preheat pool water.